I have seen more and more of my colleagues at work using electric scooter to commute from train station to the work place (about 2km away). Some of them look big and tough enough to accommodate a golfer and a cart bag! Now that's some serious power.... a comparable two passengers golf cart runs at 3,3000W, at least 10 times heavier and cost at least 6 times more... and more importantly not portable. 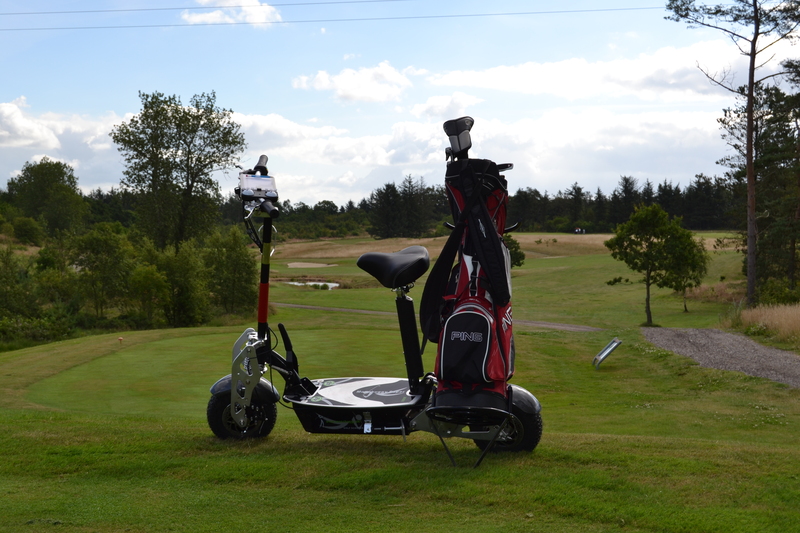 As me and my bag run around 100kgs (under the weight limit), this present a good alternative to hiring a golf cart. My calculation suggest it will take less than 20 golf cart hires to pay for the scooter. What are my chances here that this will work? Edited by the piranha, 22 May 2017 - 08:15 PM. Tyres are far too narrow meaning they would dig in more and damage course and no sensible golf club worker would allow that to be ridden on course.Omo. Unless you play on a particularly flat course, I suspect that it will not last for 18 holes. Do the maths to compare with a Parmaker or similar and I think you'll find it's a bit light on battery capacity. A few of the guys at my club have something similar to this, but I think they spent $900-1100 to get the better models. Some of the guys carry their bags and a couple of them attach a cheap trolley and then tow them. My club pro was selling ones similar to this about a year ago. They seem to go alright. -- price is $2,500 AUD... bit more expensive than I what I got in mind. And they mentioned that "...We have documentation for the wheel pressure pr. sq. cm (the pressure is less than a normal Golfcar with 2 persons) so no damage to the Fairway...."
Edited by the piranha, 23 May 2017 - 06:18 PM. Gawd imagine banging around on that thing afterva schooner or 7! I wanted to take one for a test run but they only had an instore display model. I could rock that I reckon. Ozdevil sized golfers need not apply though I reckon, dont think they'd have enough juice to get through an entire round. At that price? Tell him he's dreaming. It says up to 35km depending on terrain and load. Even a fairly short course will have you doing at least 10km. Then the question is load, comparing a big Aussie with a bag of clubs to a little Asian guy rolling along level paved roads. I'm just a bit doubtful it will have enough capacity. Perhaps compare the specs to one of those skate caddies.